When I was growing up, potatoes ruled the roost when it came to side dishes at dinnertime. At least when Daddy-o was sitting at the evening table. Daddy loves his spuds–baked, roasted, mashed, steamed, fried, scalloped…he didn’t care–just as long as they were on the table, sitting next to his protein and his salad. I was also a fan of the potato, but I was a little pickier in my tastes. I didn’t much care for steamed new potatoes, because even tossed with butter and some chopped parsley, steamed potatoes just seemed kind of boring. In my book, there’s zippo excitement about a steamed potato. Too bad, because that was Mama’s go-to method of serving potatoes on a weeknight. And sure, it’s hands-down the easiest way to prepare them. I’d usually eat them, but I wasn’t thrilled. If you wanted to thrill me, you’d mash the suckers, or double-bake them with some chives and gooey cheddar on top or (if you really wanted to thrill me) bathe them in lots of creamy sauce and cracked black pepper, as Mama did in this old relic of a recipe. Mama, ever health-conscious, rarely prepared potatoes that way, though. Creamed potatoes were a special occasion dish, much to my disappointment. It was lucky that I had a high metabolism as a kid, because my tastes always ran to the decadent side of the spectrum. I’m surprised I wasn’t shaped like a human snow globe. I guess I had Mama to thank for that, because we always, always had both a salad and another vegetable on the dinner table, and I was fully expected to ingest them both. Things got a little more lax when Daddy was on the road for work, when Mama would rely on rice or a nice, warm roll on the side of the plate. This delighted me because I loved, loved, loved rice. One of my favorite comfort foods growing up was big bowl of Uncle Ben’s converted rice, slathered in butter and salted to death. Actually, I still love eating that white trash delicacy, particularly when I’m feeling blue or punky. Those childhood favorites have a way of sticking with a girl. b) Mama adored pasta, so when Daddy was away, pasta was our main dish, because relegating pasta to a side dish was a felony, in her opinion. To her way of thinking, if you’re going to eat pasta, you’re going big. Preferably topped with a hearty meat/red sauce and that parmesan poseur of a cheese that came in the green canister. In her defense, it was North Dakota circa 1970, so we really didn’t know any better, did we? c) The last reason, also a product of 1970 North Dakota mindthink–we believed pasta came in three shapes: spaghetti, macaroni and egg noodles (always a bed for those Scandinavian meatballs in some gravy-ish substance). Those were main-dish shapes, not side-dish shapes. Clearly. I must admit, it’s taken me a while to come around to the idea of pasta as a sidekick, but then I discovered orzo, and I’ve never looked back. Orzo is the bomb. 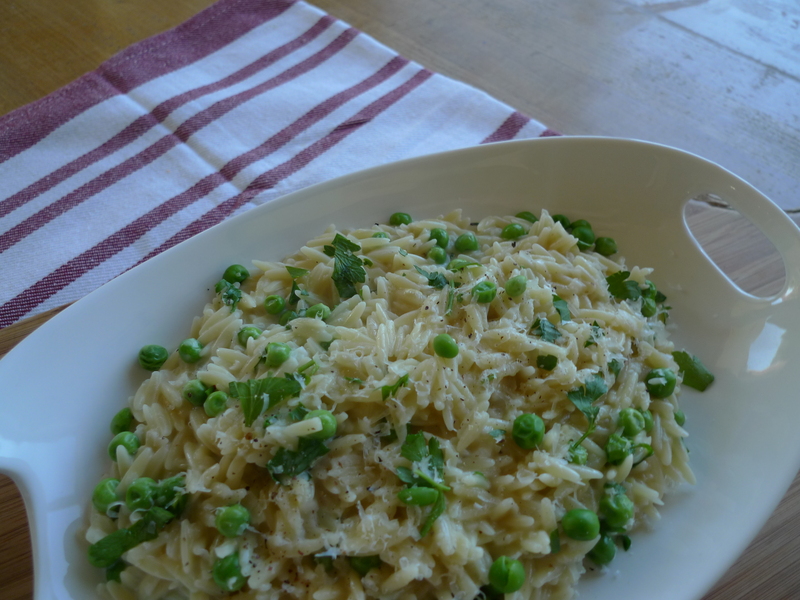 Orzo looks kind of like rice, but it’s pasta, and it’s delicious. It also cooks faster than rice, which makes it perfect for a weeknight dinner. Plus, you can cook orzo in this handy method given below, resulting in something that resembles risotto, except without all of the constant stirring and babysitting and futzing that you have to do with normal risotto. Normal risotto is a pain in the rear, but this dish is simple to whip together and it looks impressive, to boot. 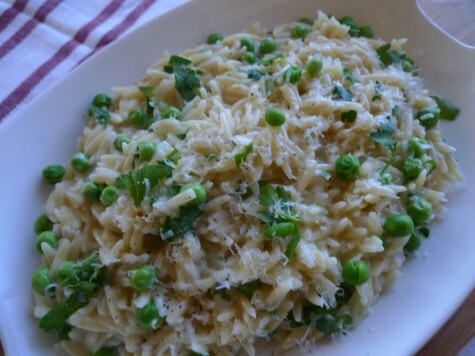 It’s slightly creamy and has a sharp, salty bite from the parmesan cheese, and it’s got peas in it, so you don’t even need another vegetable on the dinner plate. I love it when that happens. I’m not even a huge fan of peas, and I adore this dish. Of course, if your kids are totally anti-veg, you can leave the peas out and it’ll work just fine. If you’re not a glutton, this recipe serves 4 people, but I’ve been known to make a dinner out of this alone (with maybe a salad on the side). Sometimes I stir in cooked chicken or shrimp and viola! Entree. In under a half hour. I tend to go heavier on the freshly cracked pepper and the herbs when I make this, so feel free to customize a little. Sometimes I stir in a little crushed red pepper if I’m feeling racy. It’s a forgiving dish, so experiment away. 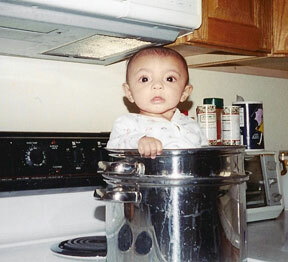 Just try not to eat the whole pot. Not that anyone we know has ever done that. Ahem. Heat oil in a heavy-bottomed medium saucepan over medium-high heat. Add the onion and saute until translucent, about 2 minutes. Add the orzo and toast it lightly for a couple of minutes. Add the wine and cook until evaporated, about 1 minute. Add the chicken stock, a cup at a time and bring to a boil. Cover pot and reduce to a simmer. Cook until liquid is almost absorbed and orzo is tender, about 8-10 minutes. Uncover pan and add peas. Heat through. Stir in the parmesan, herbs, cream, lemon zest and lemon juice. Season to taste with salt and pepper. top with extra grated cheese, if desired. * Interestingly enough, since Mama died, Daddy’s kind of come around on the pasta front. He recently admitted that he’s been zapping a Stouffer’s spaghetti and meatball dinner for himself once a week or so, and he’s enjoying it with a salad alongside. Wonders never cease. I’m crazy for Orzo too. It’s the perfect texture for a saucy side dish. How funny that Daddy-o is branching out a little. That’s wonderful!